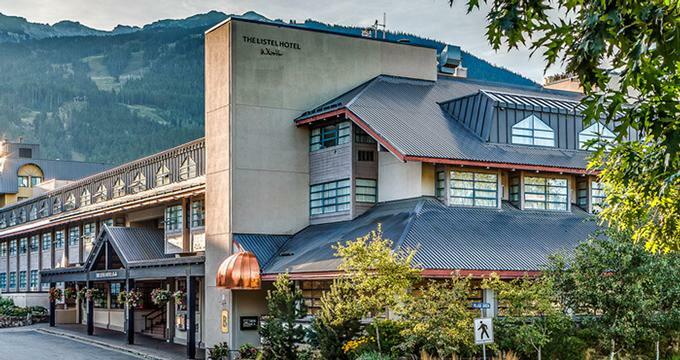 Located at the heart of Whistler Village, British Columbia, Canada, The Listel Hotel offers guests exceptional customer service and the opportunity to enjoy a true home away from home. The hotel is centrally located to allow guests easy access to alpine skiing, biking or hiking, shopping and fine dining. Although the hotel is located at the heart of the village, it is still tucked away enough in a cul-de-sac to allow guests to be just far enough away from the hustle and bustle to enjoy some quiet, relaxing moments as well. 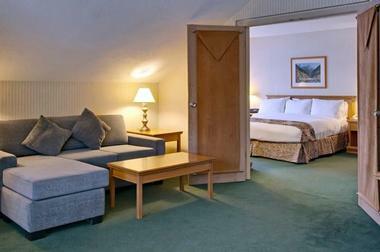 There are 98 guest rooms and suites available at The Listel Hotel Whistler, each one well equipped with modern amenities. There are pet friendly rooms available for those who wish to bring along their furry friends. Of the 98 guest rooms or suites at The Listel Hotel Whistler, there are four room categories to select from. Guests can choose from the Deluxe Two Queens, Deluxe King, Junior Suite or Premium Suite. The Deluxe Two Queen guest rooms are approximately 290 square feet of space which includes comfortable, triple sheeted beds, windows that actually open to bring in the fresh mountain air and a small refrigerator. The Deluxe King rooms feature a king size bed centered in 290 square feet of living area. The windows open to allow guests enjoyment of the mountain fresh air and the room comes with a small refrigerator for storing snacks or drinks. The High Definition television is perfect for in-room entertainment. Junior Suites offer guests approximately 350 square feet of space in an L-shaped suite. There is room for up to four guests in these suites since there is a king size bed plus a queen size pull out sofa. Guests can unwind and relax on the sofa during the day, which is situated in a semi-separated space from the king bed. As with the other rooms, these suites feature a small refrigerator and windows guests can open as they wish. The Premium Suite will not disappoint those looking for the ultimate in comfort and luxury. These suites are located on the top floor of the hotel and boast luxurious, oversized bathrooms with jetted tubs and towel warmers. There is a separate sitting area as well as bedroom area. The suite also features a dining table and chairs for private, in-room dining. These suites are equipped with one king bed and one queen size pull out sofa. They are approximately 600 square feet of elegant living space. With every stay at The Listel Hotel Whistler, guests will be treated to a complimentary continental breakfast. This is perfect especially for guests who are on the go, getting ready to spend a beautiful day enjoying the many exciting adventures and activities Whistler offers. For additional dining options, guests can treat themselves to a fine meal at Bearfoot Bistro, the restaurant located within The Listel Hotel. It is open daily at 5 p.m. for Apres Ski and dinner starts at 6 p.m. The Bearfoot Bistro is more than just a restaurant, it is an experience in itself. Guests will delight in a fusion of cuisines between local seafood and game with international selections such as Berkshire pork, Perigord truffles or Wagyu beef. The on-site wine director can assist in selecting the perfect wine to pair with whichever meal is ordered. The extensive menu has something for everyone to fall in love with, and is available as a three course selection or five course selection. To compliment the dinner menu, enhancements are an option for guests to add on to their three or five course meal. Such items on the enhancement menu include, Alaskan King Crab, Truffle Fries, Half Dozen Oysters and an extensive list of various Caviars. When guests are finished skiing for the day, they could head to the Champagne Lounge to enjoy a glass of champagne at the pewter bar which is designed with a rail of ice to keep guests champagne chilled. A dedicated oyster shucker is happy to prepare a half tray of oysters for guests to indulge in after a long day on the slopes or even just as they await dinner service. Other menu items available at the Champagne Lounge include selections such as Braised Short Rib Poutine, Confit Duck Drumettes, Dry Aged Heritage Angus Burger and various side choices. For an ultimate dining experience guests can reserve a spot at the Chefs Table. This is great for groups up to 16 people and brings guests to the heart of the action. Executive Chef Melissa Craig will personally create a delicious five course tasting menu with added personal attention for the entire table. The 20 person kitchen brigade will be hustling and bustling all around and guests at the Chefs Table get a close up view of the action. There are many options for off-site dining since The Listel Hotel is located at the heart of Whistler Village. A short walk means guests will be sure to find a café, bistro or restaurant to fulfill their craving or satisfy their hunger throughout the day. The Bearfoot Bistro is home to one of the most incredibly extensive restaurant wine selections in British Columbia, with over 20,000 bottles. The list itself features over 2100 labels as well as many champagne selections and some bottles as old as 1929. The on-site wine director and wine pairer are happy to answer any questions guests have about the wines or how to pair the perfect glass. Guests are also welcome to visit the wine cellar to view the tremendous collection. While visiting The Listel Hotel Whistler, guests should be sure to experience the Ketel One Ice Room. Not only will guests have the opportunity to sample more than 50 vodkas from around the world, they will do so wrapped in Canada Goose parkas and hats as they sit in the world's coldest vodka tasting room at a chilly -25F. Guests can taste four vodkas and experience how the extreme cold will enhance the flavor and reduce the alcohol burn. The Champagne Lounge, along with a large selection of champagnes, also serves cocktails. Their cocktail menu consists of many classic favorites from Side Cars to Mojitos as well as specialty drinks such as Brambling Man or The Right Side of Wrong. On Saturday evenings, The Champagne Lounge features a DJ for an evening of music, dancing and good times. In the summer months, The Champagne Lounge moves to the fresh air on the Patio-a wonderful place to mingle and enjoy a cocktail in the sun. There are plenty of shady spots too with oversized umbrellas and planted palms. The comfortable couches provide guests with a relaxing, laid back atmosphere to enjoy the great outdoors. Food items are also available on the patio, just as in The Champagne Lounge. Wedding receptions, reunions, or other group events are especially spectacular at The Listel Hotel Whistler. Private gatherings can be accommodated in the Wine Cellar at the Bearfoot Bistro and will allow for up to 150 guests in a full dining setting or canape receptions for up to an amazing 600 guests. The Wine Cellar is an underground, unique space which features floor to ceiling wine bottles on display. The tables are set with elegant lighting and soft, lush linens. Hosts can select from the extensive catering menu available, which will be sure to please each one of their guests. 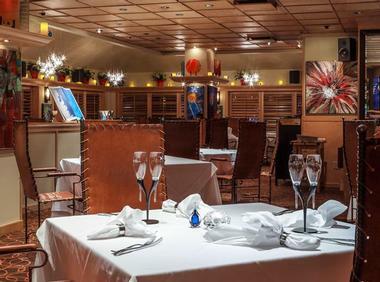 Corporate events are also welcome at the Bearfoot Bistro and in The Wine Cellar. The on-site planning staff at Listel Hotel are happy to assist in planning each event carefully with an attention to all the small details. Small to medium business meetings or even social gatherings can also be held within the hotel by reserving the meeting room or even one of the larger guest suites. While there is not a spa located on-site at The Listel Hotel Whistler, just a short drive away guests will find the famed Scandinave Spa Whistler. This spa is set in the heart of Mother Nature only minutes away from Whistler Village. Guests can relax, unwind and be pampered at the Scandinave Spa with the many treatment options available. From facials, to massages and so many other body treatments guests will receive professional service no matter which they choose. Along with the spectacular treatments, guests can indulge in the use of the hot baths, the wood-burning Finnish saunas, and the eucalyptus steam room. The fresh mountain air, the lush greenery surrounding the property and calm atmosphere will have guests feeling a sense of peace and tranquility by the end of their day. There are many places patron can enjoy a few quiet moments while visiting the spa, including hammocks, solariums, outdoor fireplaces, and decks. While it is highly recommended that advance reservations are made, it is a must visit while in the Whistler area. 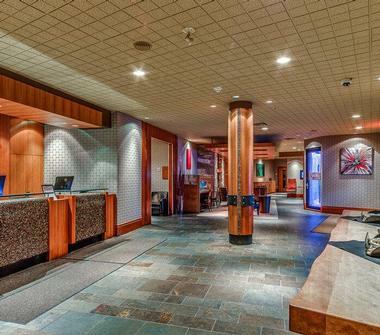 The Listel Hotel Whistler is pleased to offer a package deal to guests booking their stay. It is called “The Melt Package” and can be reserved upon booking a room or suite. Only a short six minute drive away from The Listel Hotel golf enthusiasts will find Nicklaus North Golf Course. This course is a par 71 and 18 holes of challenging, exciting golf. It is one of North America's premier courses which is why it bears the name of golfing great, Jack Nicklaus. Kids under the age of 16 can enjoy a round of golf free with a paying adult. 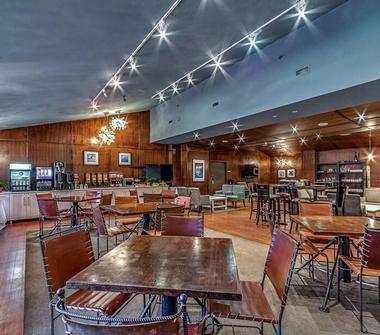 There is a pro shop on-site and the Table Nineteen Lakeside Eatery for a fine meal after a day out on the course. 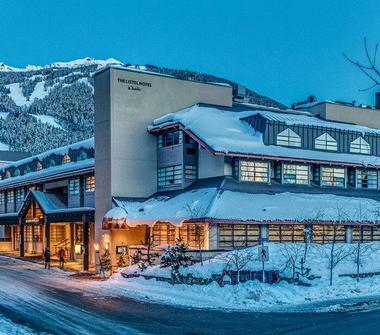 The Listel Hotel Whistler is very proud to hold a 3 Green Key rating from the Hotel Association of Canada. This designation is awarded to hotels who take their responsibility for the environment seriously by creating as little carbon footprint as possible. A hot tub and sauna are available for guest use from 8 a.m. to 10 p.m. daily. Guests can soak in the hot tub, relax their weary muscles and enjoy the view in from the picturesque windows surrounding the hot tub area. Guests who wish to travel with their furry friend will be pleased to know there are a select number of pet friendly rooms available at The Listel Hotel Whistler. There is a two pet limit per room and an additional $25 charge per night per pet. Dog walkers and dog sitters are available upon request. Kids are welcome at The Listel Hotel Whistler and will enjoy the many activities in the surrounding area, just as their parents will. There are no specific family or child services at The Listel Hotel, but this doesn't mean families won't enjoy their time.